2. What is the relationship between popular devotions and the liturgy? As Pope Paul VT recognized, maintaining the proper balance [between liturgy and devo­tions] may not always be easy and may require patient and persistent effort. He indicated that there are two extreme attitudes to be avoided. On the one hand, he rejected the position of those "who scorn, a priori, devotions of piety which, in their correct forms, have been recommend­ed by the Magisterium, who leave them aside and in this way create a vacuum which they do not fill. They forget that the Council has said that devotions of piety should harmonize with the liturgy, not be suppressed." On the other hand, he likewise did not accept the position of those who, without wholesome liturgical and pastoral criteria, mix practices of piety and liturgical acts in hybrid celebrations. It sometimes happens that novenas or similar practices are inserted into the very celebration of the Eucharistic Sacrifice. This creates the danger that the Lord's Memorial Rite, instead of being the culmination of the meeting of the Christian community, becomes the oc­casion, as it were, for devotional practices. Here Pope Paul VI admonished us that "exercises of piety should be harmonized with the liturgy, not merged into it." Saint Anthony was born Fernando Martins de Bulhões in Lisbon, Portugal. He was born into a wealthy family and by the age of fifteen asked to be sent to the Abbey of Santa Cruz in Coimbra, the then capital of Portugal. During his time in the Abbey, he learned theology and Latin. Following his ordination to the priesthood, he was named guestmaster and was responsible for the abbey's hospitality. When Franciscan friars settled a small hermitage outside Coimbra dedicated to Saint Anthony of Egypt, Fernando felt a longing to join them. Fernando eventually received permission to leave the Abbey so he could join the new Franciscan Order. When he was admitted, he changed his name to Anthony. Anthony then traveled to Morocco to spread God's truth, but became extremely sick and was returned to Portugal to recover. The return voyage was blown off-course and the party arrived in Sicily, from which they traveled to Tuscany. Anthony was assigned to the hermitage of San Paolo after local friars considered his health. As he recovered, Anthony spent his time praying and studying. An undetermined amount of time later, Dominican friars came to visit the Franciscans and there was confusion over who would present the homily. The Dominicans were known for their preaching, thus the Franciscans assumed it was they who would provide a homilist, but the Dominicans assumed the Franciscans would provide one. It was then the head of the Franciscan hermitage asked Anthony to speak on whatever the Holy Spirit told him to speak of. Though he tried to object, Anthony delivered an eloquent and moving homily that impressed both groups. Soon, news of his eloquence reached Francis of Assisi, who held a strong distrust of the brotherhood's commitment to a life of poverty. However, in Anthony, he found a friend. Anthony occasionally taught at the universities of Montpellier and Toulouse in southern France, but he performed best in the role of a preacher. So simple and resounding was his teaching of the Catholic Faith, most unlettered and the innocent could understand his messages. It is for this reason he was declared a Doctor of the Church by Pope Pius XII in 1946. He was only 36-years-old when he died and was canonized less than one year afterward by Pope Gregory IX. Upon exhumation some 336 years after his death, his body was found to be corrupted, yet his tongue was totally incorrupt, so perfect were the teachings that had been formed upon it. He is typically depicted with a book and the Infant Child Jesus and is commonly referred to today as the "finder of lost articles." The mystery of Christ, unfolded through the cycle of the year, calls us to live his mystery in our own lives. This call is best illustrated in the lives of Mary and the saints, celebrated by the Church throughout the year. There is no tension between the mystery of Christ and the celebration of the saints, but rather a marvelous harmony. The Blessed Virgin Mary is joined by an inseparable bond to the saving work of her Son, and the feasts of all the saints proclaim the wonderful works of Christ in his servants and offer the faithful fitting examples for their imitation. In the feasts of Mary and of the saints, the Paschal Mystery of Christ is proclaimed and renewed. 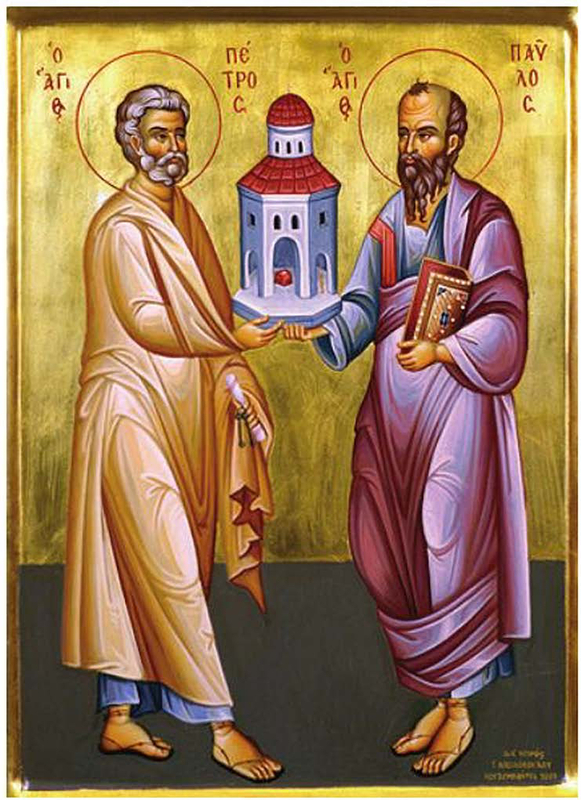 On June 2, the Catholic Church remembers two fourth­-century martyrs, Saints Marcellinus and Peter, who were highly venerated after the discovery of their tomb and the conversion of their executioner. said, was the executioner himself, who had subsequently repented and joined the Catholic Church. Marcellinus, a priest, and Peter, an exorcist, died in the year 304. According to a legendary account of their martyrdom, the two Romans saw their imprisonment as just one more opportunity to evangelize and managed to convert their jailer and his family. The legend also says that they were beheaded in the forest so that other Christians wouldn't have a chance to bury and venerate their bodies. Two women found the bodies, however, and had them properly buried. The feast of these two martyrs was included in the Roman calendar of saints by Pope Vigilius in 555.